Changing our plans to be in Japan in October wasn’t about the glorious autumnal colors, but more about avoiding the heat and peak tourist time of July. We knew that Japan would be our most expensive country and wanted to ensure that we picked the optimal time to visit, so that we could make the most of it. It was clear, though, that we were going to see some fall foliage, no matter where we went in the country and despite the best efforts of two typhoons. We’d holed up in Kumamoto during typhoon Phanfone to ensure that we saw Sakurajima at its best. Then we took refuge in the onsen town of Kinosaki during typhoon Vongfong, up to our necks in hot spring water. Our first sighting of autumn was in Miyajima, the small island close to Hiroshima – who’s ferry is conveniently covered on the JR Train Pass. 30 minutes or so on the train from Hiroshima and the a short ferry ride and we find ourselves surrounded by other tourists and deer. Lots of very tame deer. Hungry, tame deer. Deer who will pull things out of your backpack to eat. Or chew paper. Or plastic. And probably annoying small children. Then, next stop the glorious Itsukushima shrine, which at high water looks like it’s floating in the water.. it was low water. There’s a cable car to the top of Mt Misen (actually it’s not to the top, but close enough), but it was over a thousand yen, so we resorted to one of the three footpaths to the top. We took the Momji Dani path, the shortest and 90 minutes later were meeting folks, who’d taken the cable car. The walk up is pleasant, through the woods, up a lot of fairly regular paths and steps, but it’s still up. We met two lots of folks descending and two others going up, so we’d re-attained the peace we were looking for. Miyajima is one of the key spots to see Japanese Cherry Blossoms in the Spring, so if you’re heading to Japan during the months of February, March and April, be sure to head here! It was busier at the top, once the cable car folks had to join the path and ascend further to get to the viewing platform. It’s well worth the effort. It’s a glorious 360 degree view here of Hiroshima Bay and of Sea of Japan, there are volcanoes in the distance, you can spot Hiroshima and you can see the tops of trees giving an inkling that they might be starting to change color. Descending, we took the slightly longer trail, the Omoto trail, and boy did it feel longer, as we finally stumbled, through spiders webs and an increasing gloom, towards the road towards the ferry, wondering what time the last ferry might be, but making sure to watch the sun set behind the shrine, that was now floating. There was time, though before the ferry, for a Miyajima specialty – the island is known for its oysters, so we took one with a twist. A curried roll with oysters inside. An interesting take – and probably the start of our love affair with Japanese curry, but more on that later. But, as we visited the Golden Temple and garden, it was easy to spot the potential for fall. Same too for the Silver Temple, although unlike the Golden Temple they didn’t actually get around to putting the silver onto the temple, still the name remains. In Kyoto, there were geisha too, spotted as they walked to their evening appointments – and much better than the ridiculously over priced Gion Corner “entertainment”. We also had the worst room of our stay and an overall disappointment with the tourist treadmill that Kyoto appears to be. Perhaps our visit in off season wasn’t off enough. One highlight was the Fushimi shrine. First of all it’s free, secondly we visited just as the sun was setting – we’d run out of time in Kyoto, so we climbed this hill in the dark. And I’d highly recommend it! For the next stop on our Chasing Fall Tour, we headed North, way, way, North. 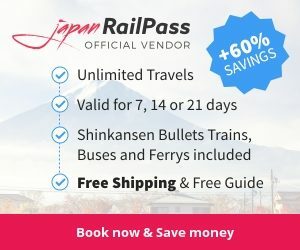 It was down to the JR Pass that we visited Sapporo, in one of those, heck we’ve got the pass, why not go – besides an overnight train means no hotel fees right moments? Of course the reserved sleepers had all gone long ago, so we were in a reclining armchair once we changed trains at Amori. Surprisingly the carriage wasn’t full, not even one third full! Boy was it chilly in Sapporo – we were now in the northern most province of Japan, Hokkaido – which you normally see advertised as the best place to ski in Asia. A trip to the Clock Tower, for the obligatory photo checked that off the list. 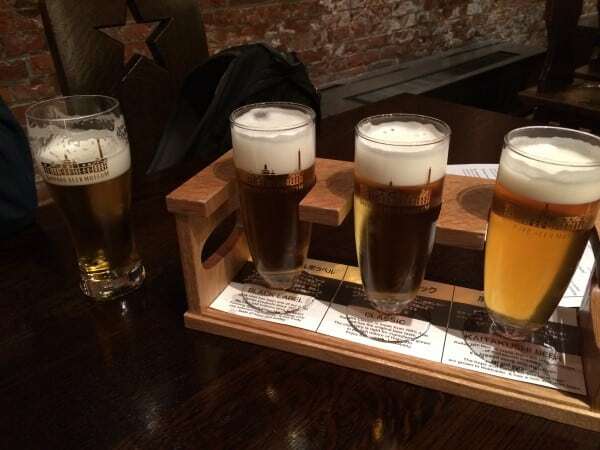 The Sapporo Brewery was another check to make – although the “tour” here is disappointing – it’s little more than a guided walk around some interesting and some bizarre displays before heading to the beer hall for a few cheaper beers. Purchasing your tickets from a vending machine, it might have been cheaper than a bar, but it certainly wasn’t value. I can understand cheese with wine, but not with beer as a snack, still as it was included we took it anyways. The highlight was perhaps the glorious colors of ivy that we saw when walking back from the Brewery. It was when we took a trip out to the Winter Sports Museum just out of the city that we saw how far advanced autumn was here in Hokkaido. That came after we blew 600 yen on the pretty awful winter sports museum – it’s situated at the ski jump hills at Miyanomori that were used in the 1972 Olympics. The museum was opened not long after that and hasn’t been updated since. There are some “fun” ski jumps and ice skating and ice dancing games you can play, but it’s hard to see how this justifies the entrance fee. The foliage outside, though was free and a hint of what was to come as we headed to Otaru. A quiet little town overrun with tourists is worth a day trip (for me it was to visit the Bank of Japan museum more than anything), but on a glorious fall day, you can see why this is such a popular place. Noboritsu is another onsen town, situated at the south end of Hokkaido – it’s a 3 hour train journey from Sapporo, a small one horse train station with just a few stopping trains a day, good clean restrooms and a bank of lockers that took care of our backpacks as we waited to catch the bus up into the town itself. There’s a greeting from the resident bear at the station first. It’s around 5km to the town, but it’s a boring walk, so we bought the return ticket from the station, loaded up on water in town and set off to try and find a map and a hike to go on. Arriving in the town, we found not a single useful printed map for where we wanted to go, so we cobbled together three, and set off heading up towards the top of the town, which smells faintly and sometimes strongly of sulphur. The area is volcanic and there are steam vents throughout the town and hot springs most everywhere. Boardwalks line the attractions noted on the free maps, and we zigzagged between small tour groups, intent on heading for the attractions, although it wasn’t busy by any stretch of the imagination. It’s a glorious show of autumn color. Just glorious. The area is known as “Hell Valley” and it’s easy to see why, with all the vents of rising steam. We walk away from the main attractions and turn right onto the road, heading for the caldera of a volcano. This is now Kuttarra Lake. It’s almost circular, although it’s not possible to walk around it. There’s a lodge – all boarded up, where we sit on the deck and eat out sandwiches, before continuing around the road to loop back into lower Noboritsu in the rain. It’s been a marvelous trek through the fall foliage of Japan, but this is our last stop chasing the leaf. we’re now heading back south before our JR Train Pass expires.